The 35th Infantry Regiment Association salutes our fallen brother, SSG Roberts Paton Burrows, who died in the service of his country on October 14th, 1970 in Phuoc Long Province, Vietnam. The cause of death was listed as ground casualty. At the time of his death Roberts was 25 years of age. He was from Denton, Maryland. 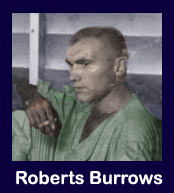 Roberts' Military Occupation Specialty was 11F40, Infantry Operations And Intelligence Specialist. The decorations earned by SSG Roberts Paton Burrows include: the Combat Infantryman Badge, the Purple Heart, the National Defense Service Medal, the Vietnam Service Medal, the Vietnam Campaign Medal and the Vietnam Cross of Gallantry with Palm Unit Citation. SSG Burrows was a Cacti soldier in the 1st BN Recon Platoon in 1966/67. He was assigned to A Troop, 1st Squadron, 9th Cavalry, 1st Cavalry Division on 08/04/1969. It has been told that this was his fourth continuous tour. He was interred in Ft Rosecrans National Cemetery, Point Loma (San Diego County) California on 10/23/70 in Plot D 180-D.